Are you thinking of using an upcoming pet holiday or observance to promote your company’s products or services? We agree, it’s a great idea. Support adoption and causes: Pet parents appreciate your passion for rescues and shelters along with support for research, companionship and cures. If you support a local group that helps pets find forever homes, share your commitment by writing a press release that tells everyone how they can get involved, perhaps offering a product or service donation as well. PetPR.com can distribute your news to local media contacts who can help share your news with pet parents in your area to generate interest and additional support. Promote wellness: There are plenty of opportunities to offer wellness tips and product recommendations that align with pet holidays. Use your veterinary and pet expertise to draft a press release that gives a few bullets of wisdom and advice on important wellness subjects, and distribute the release through PetPR.com to reach the local and regional media outlets read by pet parents near you. Show a sense of humor: Involve your staff or clients in a day to recognize their pets, especially on the holidays that have a humorous twist. Take a few photos and create a press release about the day by explaining your company’s values and your connection to and love for companion animals. Include the images within your press release, and have it distributed by PetPR.com to local media outlets to gain visibility among current and potential clients. 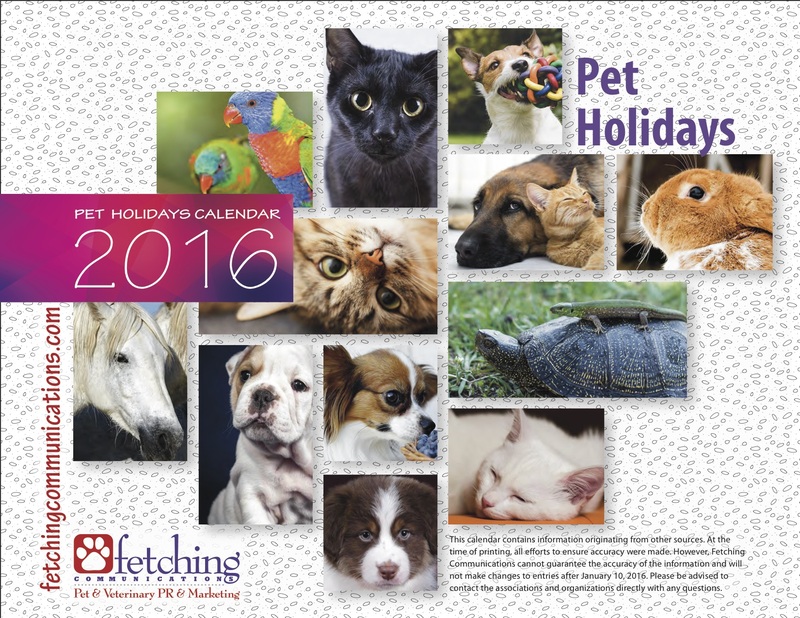 For a full list of pet and veterinary-focused holidays and industry events scheduled for 2016, download the free calendars from Fetching Communications here. Our 2017 calendars will be published at the end of 2016.